Rodney Triumphant, or Admiral Lee - Shore in the Dumps, James Gillray, 1782, Walpole Library. 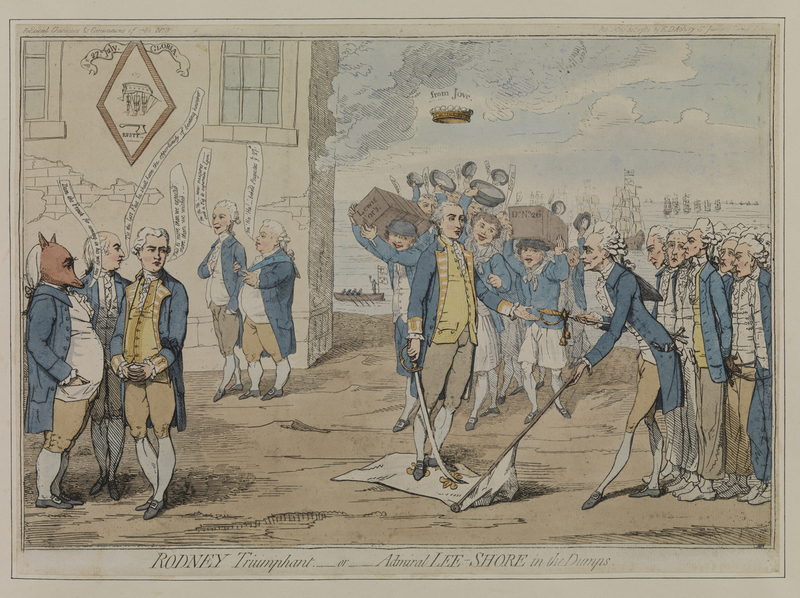 Rodney Triumphant, or Admiral Lee - Shore in the Dumps, James Gillray, 1782, National Maritime Museum. 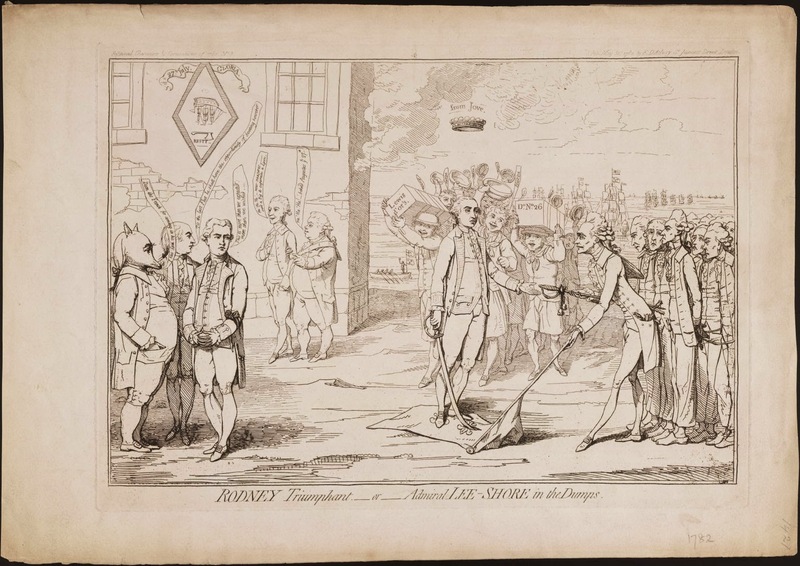 Celebrating the Battle of the Saintes, our cartoonist has taken the opportunity to stick one to the French and to the politicians that he perceives as opposing the success of the Royal Navy. In one corner, a passel of Parliamentarians converse about their ill luck and their hopes to deprive Admiral Rodney of future victories. 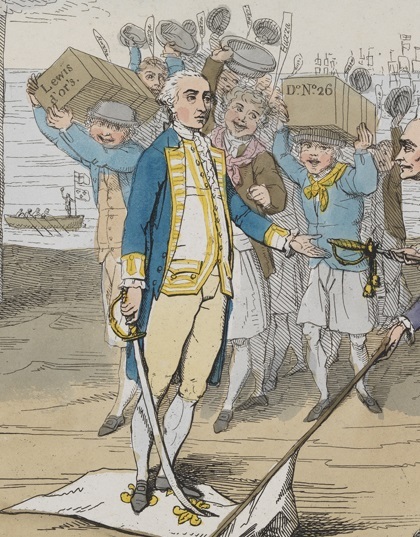 Most important to our interests is the portrayal of First Lord of the Admiralty Augustus Keppel. Keppel moved against Rodney almost as soon as he took office, only to find out about his victory at the Saintes almost immediately. It stained his remarkably short career as First Lord right from the start. 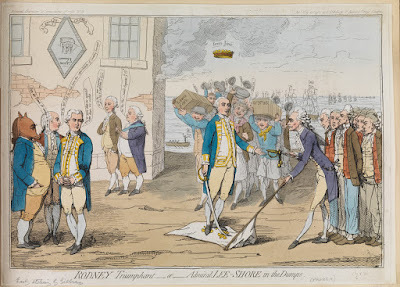 It is almost certainly Keppel that Gillray condemns as "Admiral Lee - Shore." Admiral Rodney, standing on the French flag, accepts the sword of Comte de Grasse. It is a scene oft repeated by political cartoonists of the time. It is also a valuable scene for us, as it is wonderfully detailed! The tars wave their hats, shout "Huzza," and carry boxes of "Lewis d'or's." Just like yesterday's entry, these boxes signify the wealth that Britain bleeds from her enemies at sea. 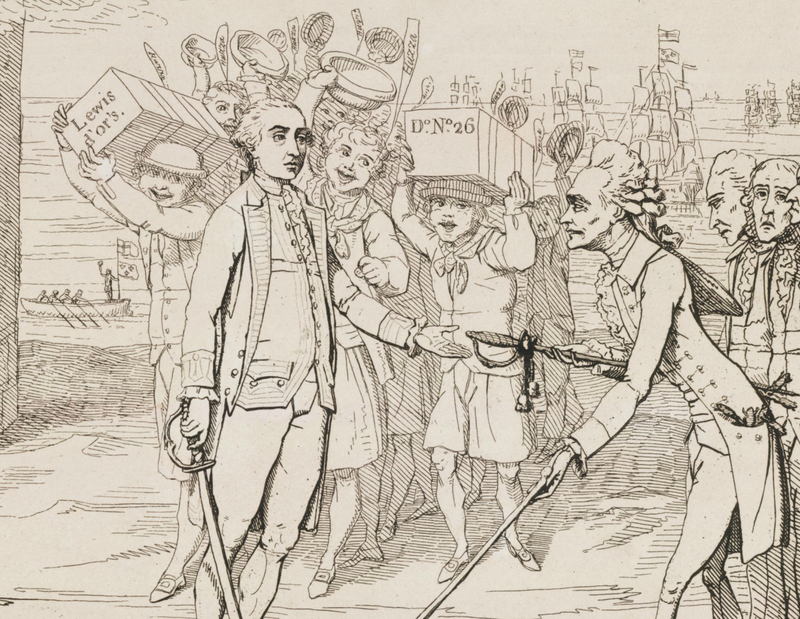 With a wide smile, a tar immediately to the right of Admiral Rodney watches with delight as de Grasse surrenders his sword. Our jack wears a round hat with narrow and slightly upturned brim, a striped neckcloth that is yellow in one coloration and white in the next, and single breasted blue jacket with narrow slit cuffs closed by a single button. 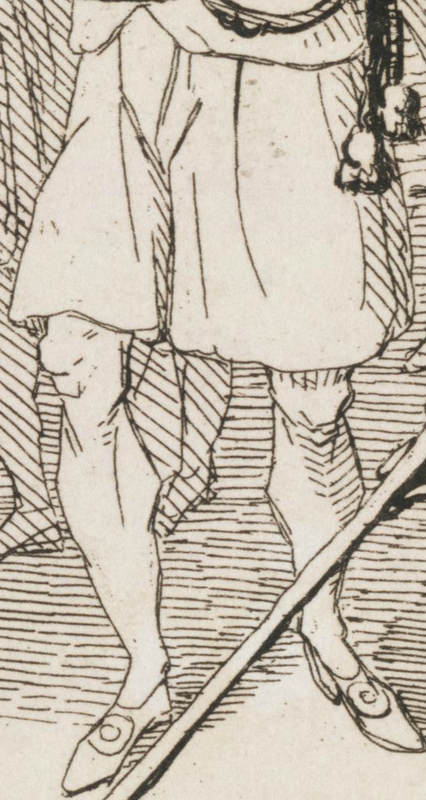 It is difficult to tell if the artist intended slit pockets at the waist, as the line (framed between the grip and guard of de Grasse's sword) could be interpreted as a crease in his fabric or as a pocket. His slops are surprisingly short, ending above the knee. 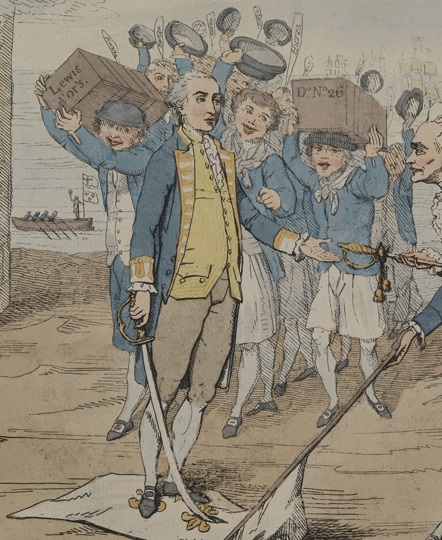 We don't have any view of his breeches, but that doesn't mean they aren't there. His stockings are white, running to pointed toe shoes with oval buckles. Somehow sporting an even wider smile than his mate, this tar is even better turned out. He wears a cap with narrow upturned brim (probably a knit cap, though I am not sure), a single blue breasted jacket with open slit cuffs, and a single breasted waistcoat with the top few buttons open and a cutaway at his waist. Just like his mate he wears petticoat with white stockings and pointed toe shoes, though these bear rectangular white metal buckles. His waistcoat is painted buff by one colorist, and left white by another. Just as the ships in the right background proudly fly English flags over French, so too does this launch. 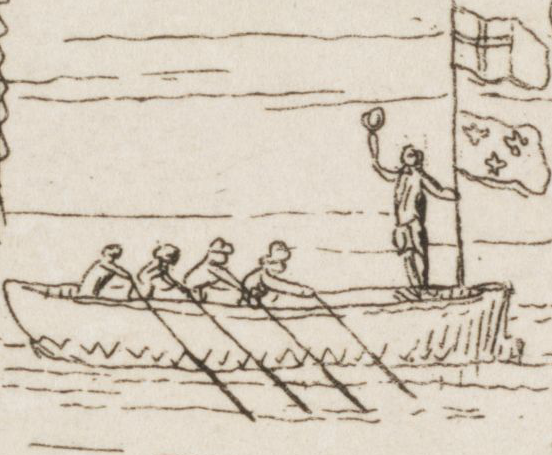 The coxswain at the stern is less concerned with steering than he is with celebrating. 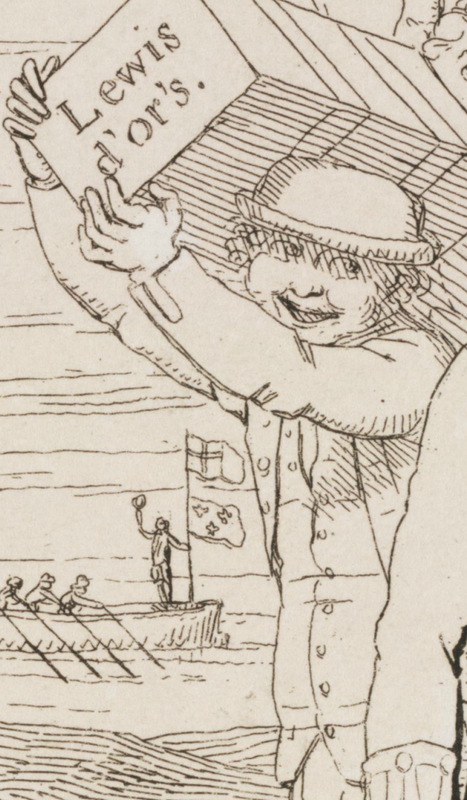 His round hat waves in the air, and he stands tall, giving us a view of his slops. 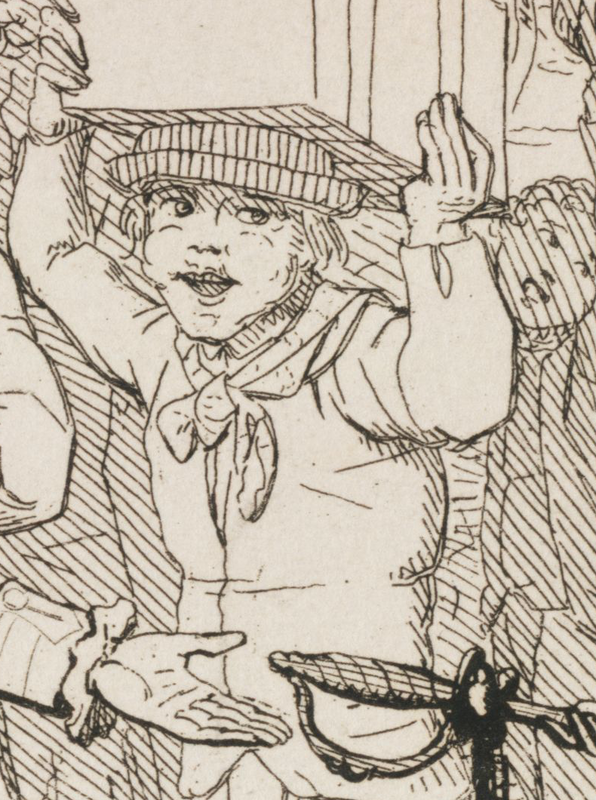 The oarsmen wear what appear to be barge caps, but we can say nothing more significant about them. Our colorists take a different take with this detail: one leaves the men entirely without color, the other hastily painted blue jackets on the oarsmen and neglected the coxswain.